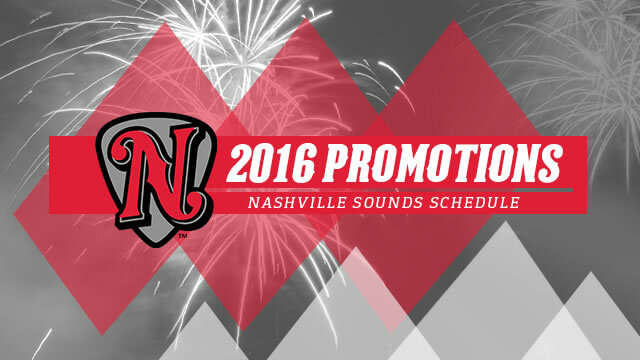 NASHVILLE, Tenn. - The Nashville Sounds Baseball Club is pleased to announce its full promotions schedule for the 2016 season. The 72-game home schedule includes ticket discounts, special guest appearances, theme nights, day-game parties, throwback jerseys, family days and 14 fireworks shows. It all starts with a bang on Opening Day at First Tennessee Park on Thursday, April 7 when the Sounds open the season against Oklahoma City at 6:35 p.m. The night will feature post-game fireworks and a ballpark aerial photo exit giveaway to 10,000 fans presented by First Tennessee. On Saturday, May 7, the Sounds will Pink out the Park for Breast Cancer Awareness. The first 5,000 fans in attendance receive a special pink T-shirt and the Sounds will wear pink jerseys to be auctioned off with proceeds benefiting the Susan G. Komen Foundation. The Human Cannonball, David "The Bullet" Smith, rockets into First Tennessee Park on Tuesday, May 17. After the Sounds host the Fresno Grizzlies, Smith will launch himself out of a 35-foot-long cannon and travel over 150 feet through the air. He has performed over 500 cannon shots around the world and Nashville is on deck. The Sounds welcome back 2015 pitcher and former Cy Young Award Winner Barry Zito on Monday, August 29 for the final Major League Monday of the season. In addition, the first 2,000 fans in attendance will receive a Barry Zito bobblehead. Thursday, September 1 signals the final home game of the 2016 season. First Tennessee Park's Season Finale Celebration will feature post-game fireworks, Fan Appreciation Night and the first 3,000 fans in attendance will receive a mini-stadium replica giveaway presented by First Tennessee. Signature promotions for the 2016 season include 80s Night, Bark in the Park and the Sounds and Hounds Pet Calendar Giveaway, ZOOperstars appearance, Star Wars Night, and Jimmy Buffett Night and Luau. Other notable promotions include Superhero Night and the Superhero Cape Giveaway presented by Monroe Carell Jr. Children's Hospital at Vanderbilt on Sunday, May 22. On Thursday, July 7, it's Sports Night at First Tennessee Park and the first 2,000 fans in attendance receive a Sounds duffle bag presented by the Middle Tennessee Hyundai Dealers. The full promotional schedule can be found here. Single-game tickets will be available for purchase at the Sounds ticket office, online or by phone (615-690-4487 ext. 2) beginning Monday, March 7 at 9:00 a.m.
Monday: "Major League Mondays" presented by 650 AM WSM and "Kroger Plus Mondays" - Every Monday is "Major League Monday" with co-branded Oakland Athletics giveaways and/or guest appearances by former Major League Baseball players. Special guests will be announced at a later date. Additionally each Monday, the Sounds and Kroger are offering fans the opportunity to purchase a "Family 4-Pack" that includes 4 Select section tickets, 4 hot dogs and 4 fountain sodas for just $44 when they show their Kroger Plus card. The "Family 4-Pack" is available for day-of-game or advanced purchase. The offer is only available for purchase at participating Ticketmaster locations inside Kroger stores and is not available at First Tennessee Park. More information is available at www.nashvillesounds.com/kroger. Tuesday: "Live From Nashville, it's Tuesday Night" presented by TN Media - Every Tuesday, First Tennessee Park will host entertainment that includes special musical guests, incredible sideline talent and complete theme night transformations. Fans are encouraged to dress up, win prizes and enjoy the party. Wednesday: "Noon Bash in Nash" presented by 102.5 The Game - Enjoy fun in the sun as the Sounds play all seven Wednesday home games at noon. Take part in the weekly party at First Tennessee Park, the "Noon Bash in Nash." The Sounds also offer discounted tickets of $8 to seniors (60 and older) in Corner sections. Thursday: "Throwback Thursdays" presented by iHeartMedia - Every Thursday, the Sounds will wear throwback jerseys to commemorate the team's original uniform style from 1978. Professional baseball returned to Nashville in '78 after a 15-year hiatus and has remained a constant ever since. Fans can purchase Coca-Cola fountain soda, domestic draft beers and 12oz. cans for $2 each. Bud and Bud Light 16oz. cans and import and craft draft beer can be purchased for $3 each. Thursday, April 7 vs. Oklahoma City is not included. Friday: "FOX 17 Friday Fireworks" presented by Koorsen Fire & Security - Following all 11 Friday home games, a fireworks extravaganza takes place at First Tennessee Park. Sunday: Piedmont Natural Gas and Tennessee 811 "Military Sundays" and "Family Fun Day" presented by WSMV Channel 4 - Bring the whole family out to First Tennessee Park and take part in pre-game autograph sessions with select Sounds players every Sunday. Also, kids 12 and under can participate in post-game running of the bases presented by First Tennessee. The Sounds extend their military appreciation with special pricing for active and veteran military men, women and families as they proudly wear camouflage jerseys during every Sunday game. The game-worn jerseys will be auctioned off during the final Sunday home game on August 14. Discounted tickets as low as $6 are available in various sections based on availability. Military I.D. must be presented to be eligible for discount. The Sounds' complete 2016 schedule for all 144 Pacific Coast League games can be found here. The 2016 season will be the Sounds' 19th year in the Pacific Coast League and their second as the Oakland Athletics' top affiliate. The Sounds begin the season at First Tennessee Park when they host the Oklahoma City Dodgers on Thursday, April 7 at 6:35 p.m. Season ticket memberships are available now by calling (615) 690-4487 or by visiting www.nashvillesounds.com.